Crimson is designed to operate with your Digital Audio Workstation. 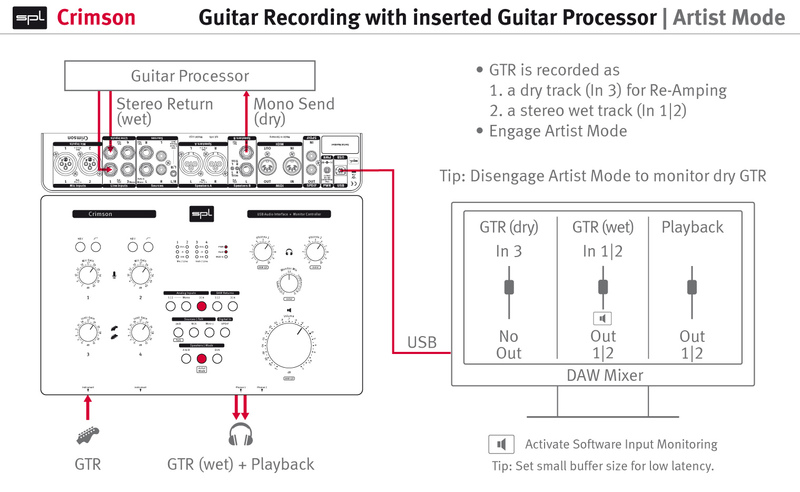 But you can also do a lot with it as a stand-alone device: plug in an instrument and play. Connect a microphone and sing along. 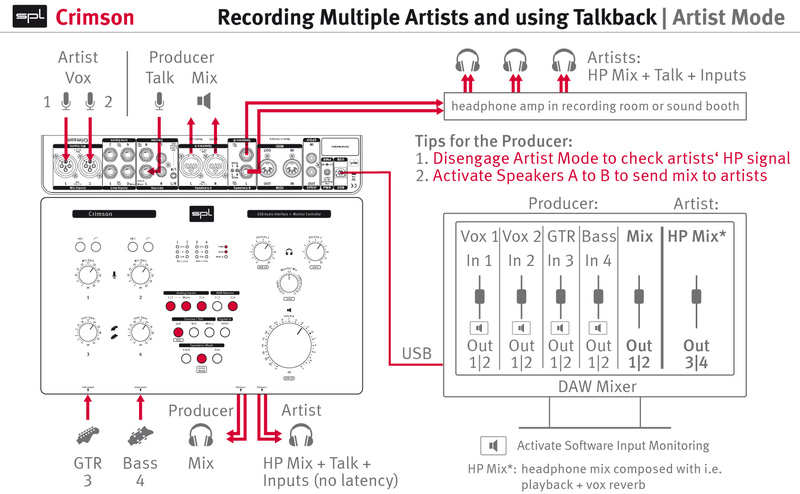 Mix your own monitor signal with playback or guide tracks from any source – including your smartphone. What you are playing is not bad? Turn on the DAW and record it. The Crimson leaps forward to set a new sound quality benchmark in its price range. With the Crimson you have a boutique device at a fraction of the price we used to know from traditional engineering and manufacturing. 2 microphone inputs (XLR) 2 Instrument inputs (TRS) 4 balanced line inputs (TRS) 2 S/P-DIF Note: any 4 analog channels can be recorded simultaneously. Including S/P-DIF, six channels can be recorded simultaneously. Do I need to install software to operate Crimson? No. All controls and functions you need to have at hand are available as hardware controls and switches. Do I need to have the DAW connected to work with Crimson? No. 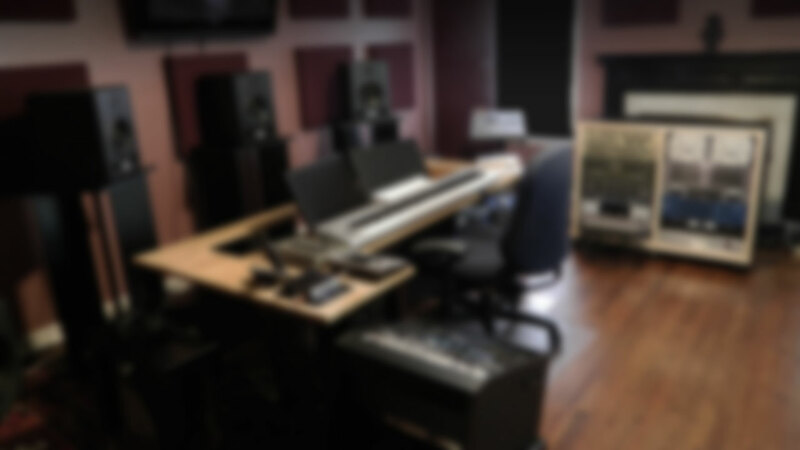 All analog functions such as mic and instrument preamps, line inputs, monitoring, sources listening, headphones and speakers are fully operational without a DAW connected. 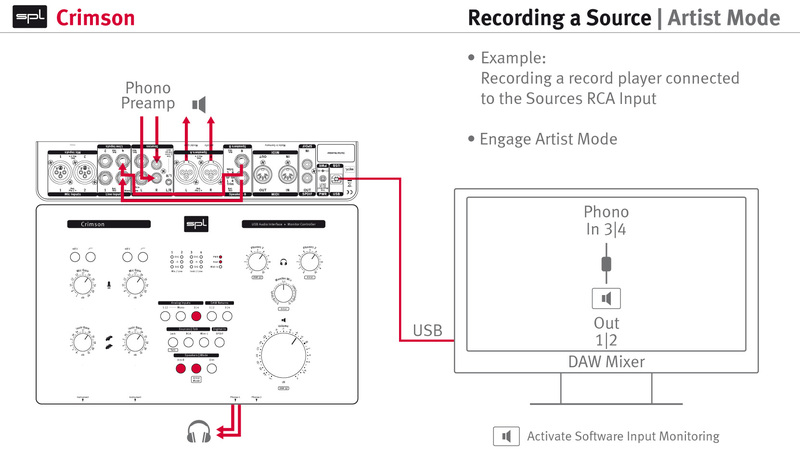 If you want to record or use the MIDI and SPDIF I/O you need to connect the DAW. Which operating systems is Crimson compatible with? Which DAW host programs has Crimson been tested with? We do not exclude further programms, of course, and will complete the list when tests have been made. Can Crimson be powered through the USB bus? No, Crimson requires its own power supply at all times. Which AD/DA converters are used in Crimson? High-quality, professional-grade analogue to digital and digital to analogue converters are used which provide a signal to noise ratio of 115dB. What sample rates does Crimson support? 44.1, 48, 88.2, 96, 176,4, 192 kHz. What bit depth are the Crimson AD/DA converters? The AD/DA converters are 24bit. How do I select inputs? Line 1 has preference over Mic 1, Line 2 has preference over Mic 2. Instrument 3 has preference over Line 3, Instrument 4 has preference over Line 4. In order to monitor a stereo signal via Line input 3 and 4 no instrument ought to be connected. Line input 3 will be mono on the monitoring bus if Line 4 is free. Where is the mono switch? The Crimson does not have a mono switch for the speaker outputs, because mono summing can easily be achieved within the DAW by inserting the free bx_solo plug-in into the master output buss. Plugin Alliance offers a bundle of four free plug-ins, which includes bx_solo, here. Why is there a signal present at the SPDIF input although there is no cable connected? 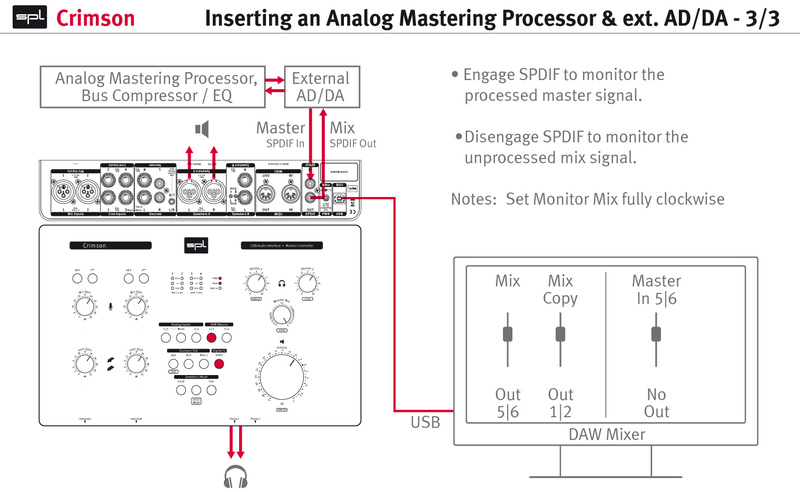 If no signal is present at the SPDIF input connector the SPDIF Out signal of channels 5|6 will be routed back to the DAW and you see 5|6 re-appearing as inputs 5|6. When using quad samples rates (176.4k and 192k) the SPDIF Out (DAW out 5|6) carries the DAW out 1|2 signal. Why? In the quad sample rates modes Crimson only supports 4 outputs. 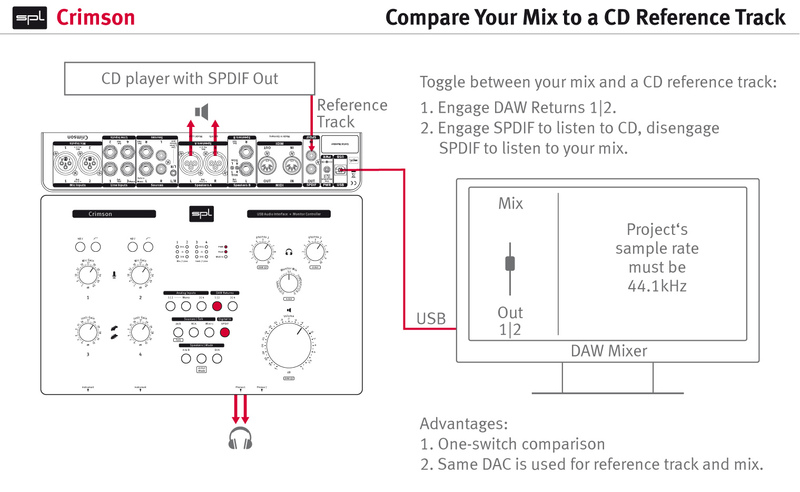 DAW out 1|2 is copied to the SPDIF out (DAW 5|6). Does Crimson provide AES/EBU compatibility via it’s SPDIF I/O? 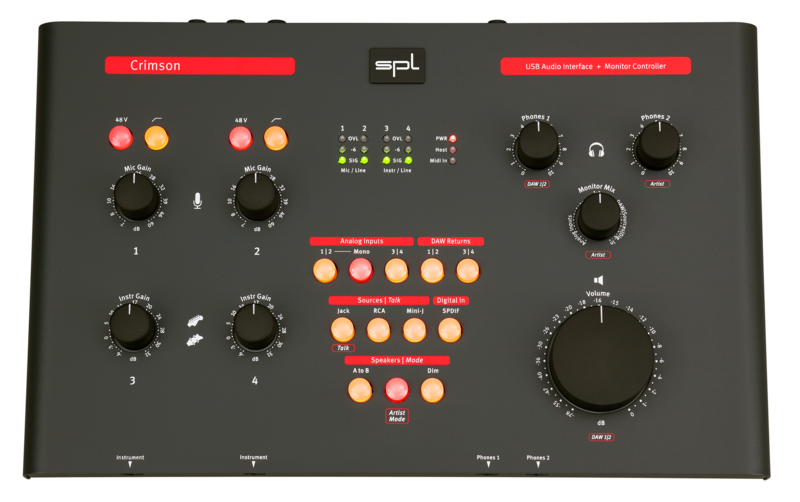 The Crimson SPDIF I/O is compatible with the AES3 format this is sometimes referred to as SPDIF Professional format. Note that there are electrical differences between the SPDIF and AES specifications. 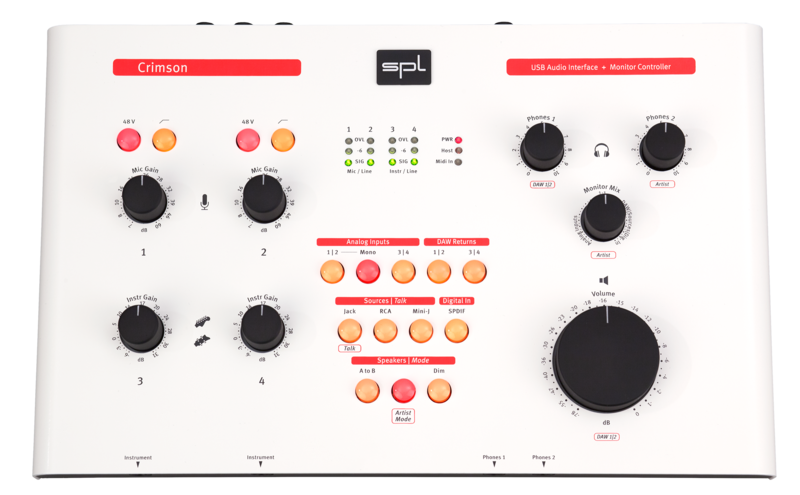 There should be no problems in an AES device receiving a SPDIF Professional signal from Crimson, but the Crimson SPDIF input may in rare cases not be able to correctly receive an AES signal. What level does the Dim button attenuate by? When the DIM button is depressed, the SPEAKERS A+B outputs are attenuated by 20dB. Can Crimson be used for 5.1 monitoring? No. Crimson is intended for stereo use only. Why is there no higher sample rate available in the Audio MIDI setup of the host program than 96kHz? 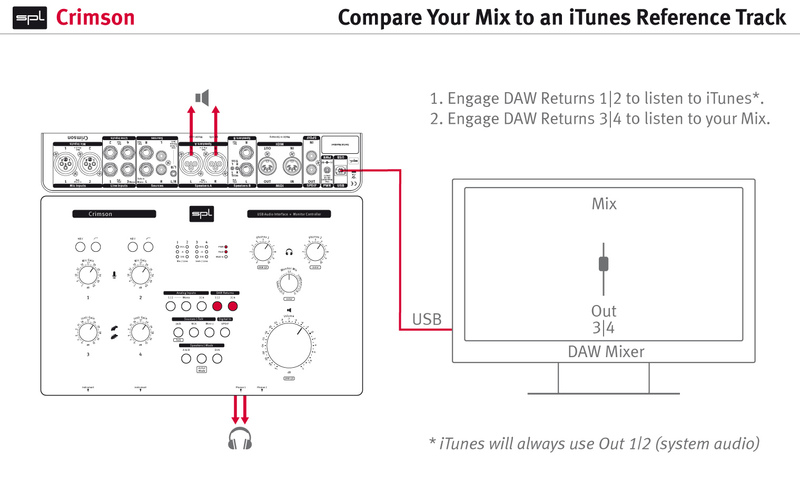 If no Crimson driver is installed, Crimson runs with Apple Core Audio which only supports sample rates up to 96kHz. Download the Crimson driver for MAC by clicking the MAC icon to the right. Why should I install the Crimson driver for MAC? You will have quad sample rates (176.4k and 192k) available. You will be using the sample accurate HAL driver (ASIO-like) instead of the not sample accurate Core Audio driver. Do I need an app to run the Crimson on an iPad? No. Crimson is a hot-plugging Class 2 device and does not need a special driver or app to operate. An original Apple camera adapter is required for connection. I do not hear a microphone input. 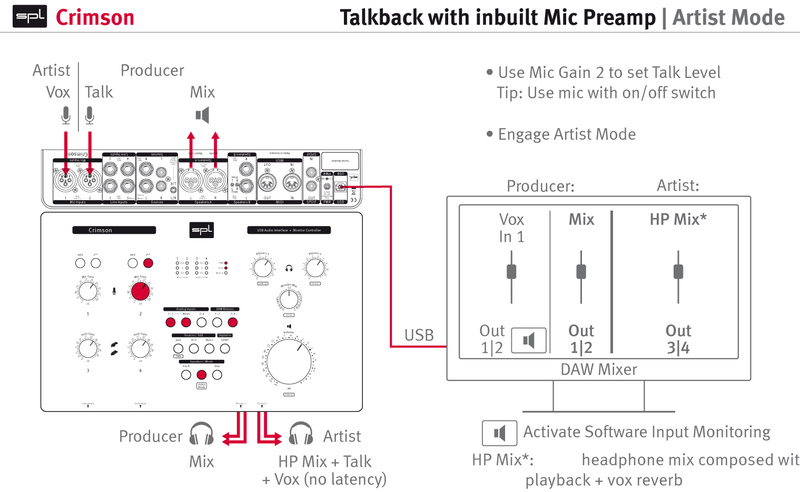 Check if a mic is connected to the XLR mic input 1 (or 2). If a line input is plugged into 1 (or 2), disconnect it. 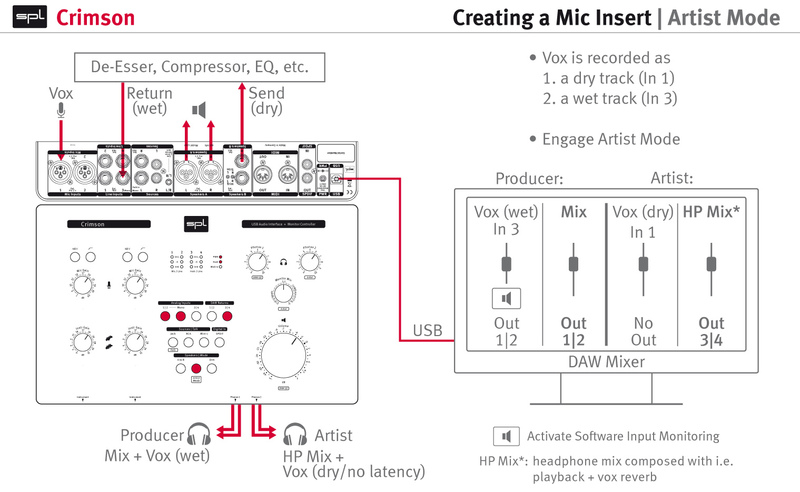 A Line inputs is given preference over the respective mic input. 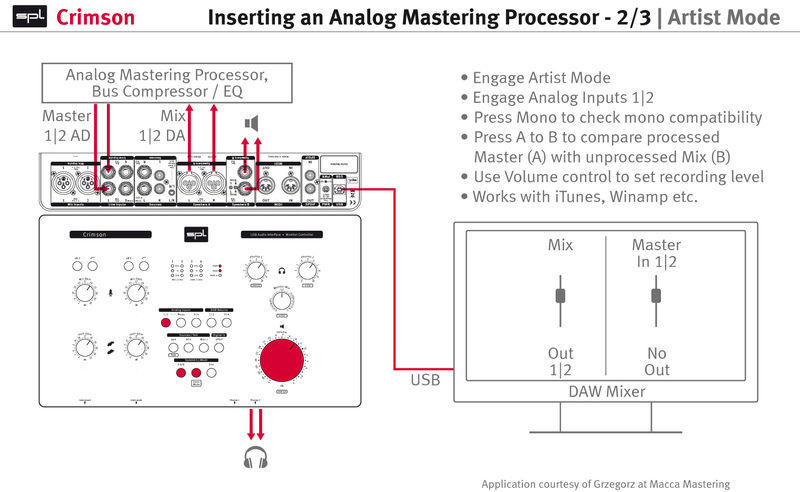 Check if 1|2 is engaged in the Analog Inputs section. Turn the Monitor Mix control to the center 1:1 position. Turn up the Phones gain control or the Volume control. Check that +48V phantom power is switched on if necessary (when using a condenser mic). I do not hear line input 3 (or 4). Check if a line level signal is connected to the line input 3 (or 4). 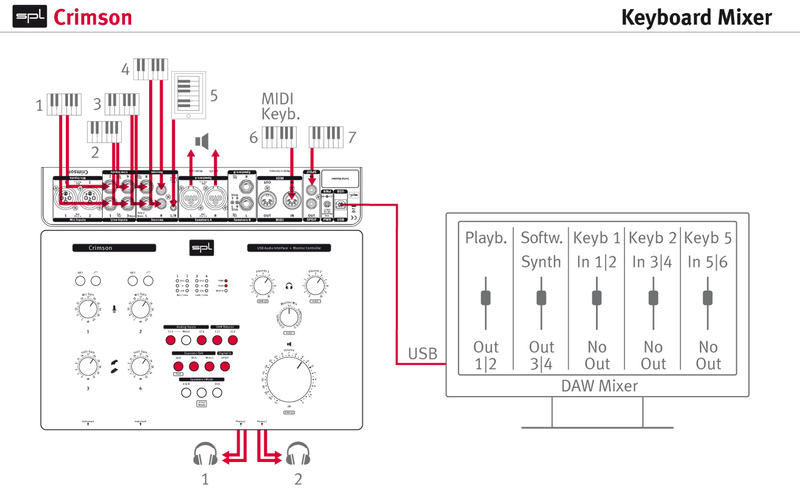 If an instrument input is plugged into 3 (or 4), disconnect it. An instrument input is given preference over a line input. Check if 3|4 is engaged in the monitoring section. There is no signal on Speaker B outputs. Switch on Speaker A to B in the Speakers | Mode section. Turn up the Volume control. In Artist Mode why is the DAW Return 1|2 signal lower in level compared with the Speakers A to B signal? These are supposed to be the signal signal, right? Yes, they are the same signal. Please check the Monitor Mix control. If turned fully clockwise the level is as loud as via Speakers A to B. If this is set to 1:1 the DAW Returns 1|2 signal is 3dB lower in level. When plugging in a CD player into the SPDIF input there is a warning coming up that the sample rate has been changed. Why? This happens when the sample rate used in your project is not 44.1kHz. The digital output of CD player is usually 44.1kHz only and the session needs to be in that format. 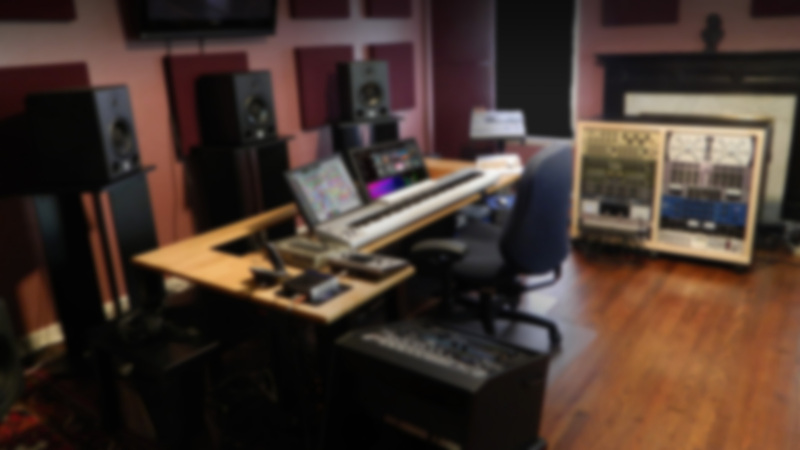 When comparing your mix to reference recordings it is essential that there is no sample rate conversion occuring. My CD player is far too loud when connected to the RCA inputs (Sources). Crimson has inbuilt preamplifiers to boost the consumer level of most HiFi equipment from -10dBV to the professional level of 0dBu. This preamp is active by default. If your CD player is too loud and you cannot adjust the output level on the CD player go to the DIP switches on the bottom side of the Crimson and switch Dips 1 and 2 to ON. This de-activates the preamps. My MP3 player is far too loud when connected to the Mini-J input (Sources). Crimson has in-built preamplifiers to boost the very low output level of e. g. iPhones or iPads by +15dB to make them comparably loud to the professional level. This preamp is active by default. If your MP3 player is too loud and you cannot adjust the output level go to the DIP switches on the bottom side of the Crimson and switch Dips 3 and 4 to ON. 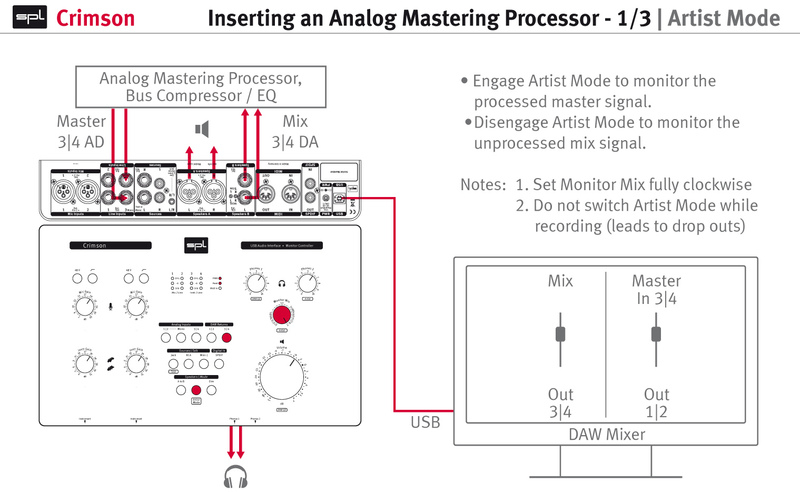 This de-activates the preamps.